AGGRENOX ® (aspirin/extended-release dipyridamole) is a combination antiplatelet agent intended for oral administration. Each hard gelatin capsule contains 200 mg dipyridamole in an extended-release form and 25 mg aspirin, as an immediate-release sugar-coated tablet. In addition, each capsule contains the following inactive ingredients: acacia, aluminum stearate, colloidal silicon dioxide, corn starch, dimethicone, hydroxypropyl methylcellulose, hydroxypropyl methylcellulose phthalate, lactose monohydrate, methacrylic acid copolymer, microcrystalline cellulose, povidone, stearic acid, sucrose, talc, tartaric acid, titanium dioxide and triacetin. The antithrombotic action of AGGRENOX (aspirin/extended-release dipyridamole) is the result of the additive antiplatelet effects of dipyridamole and aspirin. Dipyridamole inhibits the uptake of adenosine into platelets, endothelial cells and erythrocytes in vitro and in vivo ; the inhibition occurs in a dose-dependent manner at therapeutic concentrations (0.5-1.9 µg/mL). 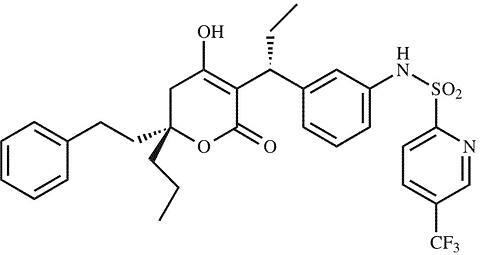 This inhibition results in an increase in local concentrations of adenosine which acts on the platelet A 2 -receptor thereby stimulating platelet adenylate cyclase and increasing platelet cyclic-3',5'-adenosine monophosphate (cAMP) levels. Via this mechanism, platelet aggregation is inhibited in response to various stimuli such as platelet activating factor (PAF), collagen and adenosine diphosphate (ADP). Aspirin inhibits platelet aggregation by irreversible inhibition of platelet cyclooxygenase and thus inhibits the generation of thromboxane A 2 , a powerful inducer of platelet aggregation and vasoconstriction. Absorption: Peak plasma levels of dipyridamole are achieved 2 hours (range 1-6 hours) after administration of a daily dose of 400 mg AGGRENOX (given as 200 mg b.i.d.). The peak plasma concentration at steady-state is 1.98 µg/mL (1.01-3.99 µg/mL) and the steady-state trough concentration is 0.53 µg/mL (0.18-1.01 µg/mL). Effect of Food: When AGGRENOX capsules were taken with a high fat meal, dipyridamole peak plasma levels (C max ) and total absorption (AUC) were decreased at steady-state by 20-30% compared to fasting. Due to the similar degree of inhibition of adenosine uptake at these plasma concentrations, this food effect is not considered clinically relevant. Distribution: Dipyridamole is highly lipophilic (log P=3.71, pH=7); however, it has been shown that the drug does not cross the blood-brain barrier to any significant extent in animals. The steady-state volume of distribution of dipyridamole is about 92 L. Approximately 99% of dipyridamole is bound to plasma proteins, predominantly to alpha 1-acid glycoprotein and albumin. Metabolism and Elimination: Dipyridamole is metabolized in the liver, primarily by conjugation with glucuronic acid, of which monoglucuronide which has low pharmacodynamic activity is the primary metabolite. In plasma, about 80% of the total amount is present as parent compound and 20% as monoglucuronide. Most of the glucuronide metabolite (about 95%) is excreted via bile into the feces, with some evidence of enterohepatic circulation. Renal excretion of parent compound is negligible and urinary excretion of the glucuronide metabolite is low (about 5%). With intravenous (i.v.) treatment of dipyridamole, a triphasic profile is obtained: a rapid alpha phase, with a half-life of about 3.4 minutes, a beta phase, with a half-life of about 39 minutes, (which, together with the alpha phase accounts for about 70% of the total area under the curve, AUC) and a prolonged elimination phase (lambda) z with a half-life of about 15.5 hours. Due to the extended absorption phase of the dipyridamole component, only the terminal phase is apparent from oral treatment with AGGRENOX which, in trial 9.123 was 13.6 hours. Geriatric Patients: In ESPS2 (See CLINICAL PHARMACOLOGY , Clinical Trials ), plasma concentrations (determined as AUC) of dipyridamole in healthy elderly subjects (>65 years) were about 40% higher than in subjects younger than 55 years receiving treatment with AGGRENOX. Hepatic Dysfunction: No study has been conducted with the AGGRENOX formulation in patients with hepatic dysfunction. Renal Dysfunction: No study has been conducted with the AGGRENOX formulation in patients with renal dysfunction. In ESPS2 patients (See CLINICAL PHARMACOLOGY , Clinical Trials ), with creatinine clearances ranging from about 15 mL/min to >100 mL/min, no changes were observed in the pharmacokinetics of dipyridamole or its glucuronide metabolite if data were corrected for differences in age. Absorption: Peak plasma levels of aspirin are achieved 0.63 hours (0.5-1 hour) after administration of a 50 mg aspirin daily dose from AGGRENOX (given as 25 mg b.i.d.). The peak plasma concentration at steady-state is 319 ng/mL (175-463 ng/mL). Aspirin undergoes moderate hydrolysis to salicylic acid in the liver and the gastrointestinal wall, with 50%-75% of an administered dose reaching the systemic circulation as intact aspirin. Effect of Food: When AGGRENOX capsules were taken with a high fat meal, there was no difference for aspirin in AUC at steady-state, and the approximately 50% decrease in C max was not considered clinically relevant based on a similar degree of cyclooxygenase inhibition comparing the fed and fasted state. Distribution: Aspirin is poorly bound to plasma proteins and its apparent volume of distribution is low (10 L). Its metabolite, salicylic acid, is highly bound to plasma proteins, but its binding is concentration-dependent (nonlinear). At low concentrations (<100 µg/mL), approximately 90% of salicylic acid is bound to albumin. Salicylic acid is widely distributed to all tissues and fluids in the body, including the central nervous system, breast milk, and fetal tissues. Early signs of salicylate overdose (salicylism), including tinnitus (ringing in the ears), occur at plasma concentrations approximating 200 µg/mL (See ADVERSE REACTIONS ; OVERDOSAGE ). Metabolism and Elimination: Aspirin is rapidly hydrolyzed in plasma to salicylic acid, with a half-life of 20 minutes. Plasma levels of aspirin are essentially undetectable 2-2.5 hours after dosing and peak salicylic acid concentrations occur 1 hour (range: 0.5-2 hours) after administration of aspirin. Salicylic acid is primarily conjugated in the liver to form salicyluric acid, a phenolic glucuronide, an acyl glucuronide, and a number of minor metabolites. Salicylate metabolism is saturable and total body clearance decreases at higher serum concentrations due to the limited ability of the liver to form both salicyluric acid and phenolic glucuronide. Following toxic doses (10-20 g), the plasma half-life may be increased to over 20 hours. The elimination of acetylsalicylic acid follows first-order kinetics with AGGRENOX and has a half-life of 0.33 hours. The half-life of salicylic acid is 1.71 hours. Both values correspond well with data from the literature at lower doses which state a resultant half-life of approximately 2-3 hours. At higher doses, the elimination of salicylic acid follows zero-order kinetics (i.e., the rate of elimination is constant in relation to plasma concentration), with an apparent half-life of 6 hours or higher. Renal excretion of unchanged drug depends upon urinary pH. As urinary pH rises above 6.5, the renal clearance of free salicylate increases from <5% to >80%. Alkalinization of the urine is a key concept in the management of salicylate overdose (See OVERDOSAGE ). Following therapeutic doses, about 10% is excreted as salicylic acid and 75% as salicyluric acid, as the phenolic and acyl glucuronides, in urine. Hepatic Dysfunction: Aspirin is to be avoided in patients with severe hepatic insufficiency. Renal Dysfunction: Aspirin is to be avoided in patients with severe renal failure (glomerular filtration rate less than 10 mL/min). AGGRENOX ® was studied in a double-blind, placebo-controlled, 24-month study (European Stroke Prevention Study 2, ESPS2) in which 6602 patients had an ischemic stroke (76%) or transient ischemic attack (TIA, 24%) within three months prior to entry. Patients were randomized to one of four treatment groups: AGGRENOX (aspirin/extended-release dipyridamole) 25 mg/200 mg; extended-release dipyridamole (ER-DP) 200 mg alone; aspirin (ASA) 25 mg alone; or placebo. Patients received one capsule twice daily (morning and evening). Efficacy assessments included analyses of stroke (fatal or nonfatal) and death (from all causes) as confirmed by a blinded morbidity and mortality assessment group. AGGRENOX reduced the risk of stroke by 22.1% compared to aspirin 50 mg/day alone (p = 0.008) and reduced the risk of stroke by 24.4% compared to extended-release dipyridamole 400 mg/day alone (p = 0.002) (Table 1). 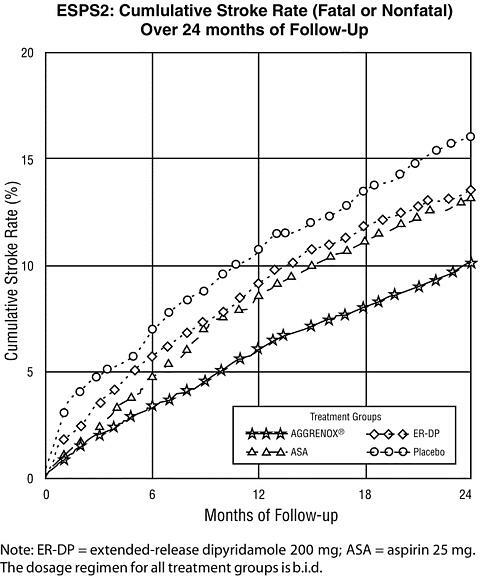 AGGRENOX reduced the risk of stroke by 36.8% compared to placebo (p <0.001). *0.010 < p-value </=0.050; **p-value </=0.010. Note: ER-DP = extended-release dipyridamole 200 mg; ASA = aspirin 25 mg. The dosage regimen for all treatment groups is b.i.d. AGGRENOX (aspirin/extended-release dipyridamole) is indicated to reduce the risk of stroke in patients who have had transient ischemia of the brain or completed ischemic stroke due to thrombosis. AGGRENOX (aspirin/extended-release dipyridamole) is contraindicated in patients with hypersensitivity to dipyridamole, aspirin or any of the other product components. Allergy: Aspirin is contraindicated in patients with known allergy to nonsteroidal anti-inflammatory drug products and in patients with the syndrome of asthma, rhinitis, and nasal polyps. Aspirin may cause severe urticaria, angioedema or bronchospasm (asthma). Reye's Syndrome: Aspirin should not be used in children or teenagers for viral infections, with or without fever, because of the risk of Reye's syndrome with concomitant use of aspirin in certain viral illnesses. Alcohol Warning: Patients who consume three or more alcoholic drinks every day should be counseled about the bleeding risks involved with chronic, heavy alcohol use while taking aspirin. Coagulation Abnormalities: Even low doses of aspirin can inhibit platelet function leading to an increase in bleeding time. This can adversely affect patients with inherited or acquired (liver disease or vitamin K deficiency) bleeding disorders. Gastrointestinal (GI) Side Effects: GI side effects include stomach pain, heartburn, nausea, vomiting, and gross GI bleeding. Although minor upper GI symptoms, such as dyspepsia, are common and can occur anytime during therapy, physicians should remain alert for signs of ulceration and bleeding, even in the absence of previous GI symptoms. Physicians should inform patients about the signs and symptoms of GI side effects and what steps to take if they occur. Peptic Ulcer Disease: Patients with a history of active peptic ulcer disease should avoid using aspirin, which can cause gastric mucosal irritation, and bleeding. Pregnancy: AGGRENOX can cause fetal harm when administered to a pregnant woman. Maternal aspirin use during later stages of pregnancy may cause low birth weight, increased incidence for intracranial hemorrhage in premature infants, stillbirths and neonatal death. Because of the above and because of the known effects of nonsteroidal anti-inflammatory drugs (NSAIDs) on the fetal cardiovascular system (closure of the ductus arteriosus), AGGRENOX should be avoided in the third trimester of pregnancy. Aspirin has been shown to be teratogenic in rats (spina bifida, exencephaly, microphthalmia and coelosomia) and rabbits (congested fetuses, agenesis of skull and upper jaw, generalized edema with malformation of the head, and diaphanous skin) at oral doses of 330 mg/kg/day and 110 mg/kg/day, respectively. These doses, which also resulted in a high resorption rate in rats (63% of implantations versus 5% in controls), are, on a mg/m 2 basis, about 66 and 44 times, respectively, the dose of aspirin contained in the maximum recommended daily human dose of AGGRENOX. Reproduction studies with dipyridamole have been performed in mice, rabbits and rats at oral doses of up to 125 mg/kg, 40 mg/kg and 1000 mg/kg, respectively about 1 ½ , 2 and 25 times the maximum recommended daily human oral dose, respectively, on a mg/m 2 basis and have revealed no evidence of harm to the fetus due to dipyridamole. When 330 mg aspirin/kg/day was combined with 75 mg dipyridamole/kg/day in the rat, the resorption rate approached 100%, indicating potentiation of aspirin-related fetal toxicity. There are no adequate and well-controlled studies in pregnant women. If AGGRENOX is used during pregnancy, or if the patient becomes pregnant while taking AGGRENOX, the patient should be apprised of the potential hazard to the fetus. AGGRENOX (aspirin/extended-release dipyridamole) is not interchangeable with the individual components of aspirin and Persantine ® Tablets. Renal Failure: Avoid aspirin in patients with severe renal failure (glomerular filtration rate less than 10 mL/minute). Risk of Bleeding: In ESPS2 the incidence of gastrointestinal bleeding was 68 patients (4.1%) in the AGGRENOX group, 36 patients (2.2%) in the extended-release dipyridamole group, 52 patients (3.2%) in the aspirin group, and 34 patients (2.1%) in the placebo groups. The incidence of intracranial hemorrhage was 9 patients (0.6%) in the AGGRENOX group, 6 patients (0.5%) in the extended-release dipyridamole group, 6 patients (0.4%) in the aspirin group and 7 patients (0.4%) in the placebo groups. Aspirin has been associated with elevated hepatic enzymes, blood urea nitrogen and serum creatinine, hyperkalemia, proteinuria and prolonged bleeding time. No pharmacokinetic drug-drug interaction studies were conducted with the AGGRENOX formulation. The following information was obtained from the literature. Angiotensin Converting Enzyme (ACE) Inhibitors: Due to the indirect effect of aspirin on the renin-angiotensin conversion pathway, the hyponatremic and hypotensive effects of ACE inhibitors may be diminished by concomitant administration of aspirin. Anticoagulant Therapy (heparin and warfarin): Patients on anticoagulation therapy are at increased risk for bleeding because of drug-drug interactions and effects on platelets. Aspirin can displace warfarin from protein binding sites, leading to prolongation of both the prothrombin time and the bleeding time. Aspirin can increase the anticoagulant activity of heparin, increasing bleeding risk. Anticonvulsants: Salicylic acid can displace protein-bound phenytoin and valproic acid, leading to a decrease in the total concentration of phenytoin and an increase in serum valproic acid levels. Beta Blockers: The hypotensive effects of beta blockers may be diminished by the concomitant administration of aspirin due to inhibition of renal prostaglandins, leading to decreased renal blood flow and salt and fluid retention. Nonsteroidal Anti-Inflammatory Drugs (NSAIDs): The concurrent use of aspirin with other NSAIDs may increase bleeding or lead to decreased renal function. Oral Hypoglycemics: Moderate doses of aspirin may increase the effectiveness of oral hypoglycemic drugs, leading to hypoglycemia. Uricosuric Agents (probenecid and sulfinpyrazone): Salicylates antagonize the uricosuric action of uricosuric agents. In studies in which dipyridamole was administered in the feed to mice (up to 111 weeks in males and females) and rats (up to 128 weeks in males and up to 142 weeks in females), there was no evidence of drug-related carcinogenesis. The highest dose administered in these studies (75 mg/kg/day) was, on a mg/m 2 basis, about equivalent to the maximum recommended daily human oral dose (MRHD) in mice and about twice the MRHD in rats. Combinations of dipyridamole and aspirin have not been evaluated for effects on fertility and reproductive performance. There was no evidence of impaired fertility when dipyridamole was administered to male and female rats at oral doses up to 500 mg/kg/day (about 12 times the MRHD on a mg/m 2 basis). A significant reduction in number of corpora lutea with consequent reduction in implantations and live fetuses was, however, observed at 1250 mg/kg (more than 30 times the MRHD on a mg/m 2 basis). Aspirin inhibits ovulation in rats. Aspirin can result in excessive blood loss at delivery as well as prolonged gestation and prolonged labor. Because of these effects on the mother and because of adverse fetal effects seen with aspirin during the later stages of pregnancy (see WARNINGS / Pregnancy subsection), AGGRENOX should be avoided in the third trimester of pregnancy and during labor and delivery. Both dipyridamole and aspirin are excreted in human milk. Caution should be exercised when AGGRENOX is administered to a nursing woman. Safety and effectiveness of AGGRENOX in pediatric patients have not been studied. Due to the aspirin component, use of this product in the pediatric population is not recommended (See CONTRAINDICATIONS ). A 24-month, multicenter, double-blind, randomized study (ESPS2) was conducted to compare the efficacy and safety of AGGRENOX (aspirin/extended-release dipyridamole) with placebo, extended-release dipyridamole alone and aspirin alone. The study was conducted in a total of 6602 male and female patients who had experienced a previous ischemic stroke or transient ischemia of the brain within three months prior to randomization. Table 2 presents the incidence of adverse events that occurred in 1% or more of patients treated with AGGRENOX where the incidence was also greater than in those patients treated with placebo. There is no clear benefit of the dipyridamole/aspirin combination over aspirin with respect to safety. *Reported by >/=1% of patients during AGGRENOX treatment where the incidence was greater than in those treated with placebo. Note: ER-DP = extended-release dipyridamole 200 mg; ASA = aspirin 25 mg. The dosage regimen for all treatment groups is b.i.d. NOS = not otherwise specified. Discontinuation due to adverse events in ESPS2 was 25% for AGGRENOX, 25% for extended-release dipyridamole, 19% for aspirin, and 21% for placebo (refer to Table 3). Adverse reactions that occurred in less than 1% of patients treated with AGGRENOX in the ESPS2 study and that were medically judged to be possibly related to either dipyridamole or aspirin are listed below (See WARNINGS ). Body as a Whole: Allergic reaction, fever. Cardiovascular: Hypotension. Central Nervous System: Coma, dizziness, paresthesia, cerebral hemorrhage, intracranial hemorrhage, subarachnoid hemorrhage. Gastrointestinal: Gastritis, ulceration and perforation. Hearing & Vestibular Disorders: Tinnitus, and deafness. Patients with high frequency hearing loss may have difficulty perceiving tinnitus. In these patients, tinnitus cannot be used as a clinical indicator of salicylism. Heart Rate and Rhythm Disorders: Tachycardia, palpitation, arrhythmia, supraventricular tachycardia. Liver and Biliary System Disorders: Cholelithiasis, jaundice, hepatic function abnormal. Metabolic & Nutritional Disorders: Hyperglycemia, thirst. Platelet, Bleeding and Clotting Disorders: Hematoma, gingival bleeding. Psychiatric Disorders: Agitation. Reproductive: Uterine hemorrhage. Respiratory: Hyperpnea, asthma, bronchospasm, hemoptysis, pulmonary edema. Special Senses Other Disorders: Taste loss. Skin and Appendages Disorders: Pruritus, urticaria. Urogenital: Renal insufficiency and failure, hematuria. Vascular (Extracardiac) Disorders: Flushing. The following is a list of additional adverse reactions that have been reported either in the literature or are from postmarketing spontaneous reports for either dipyridamole or aspirin. Body as a Whole: Hypothermia, chest pain. Cardiovascular: Angina pectoris. Central Nervous System: Cerebral edema. Fluid and Electrolyte: Hyperkalemia, metabolic acidosis, respiratory alkalosis, hypokalemia. Gastrointestinal: Pancreatitis, Reye's syndrome, hematemesis. Hearing and Vestibular Disorders: Hearing loss. Hypersensitivity: Acute anaphylaxis, laryngeal edema. Liver and Biliary System Disorders: Hepatitis, hepatic failure. Musculoskeletal: Rhabdomyolysis. Metabolic & Nutritional Disorders: Hypoglycemia, dehydration. Platelet, Bleeding and Clotting Disorders: Prolongation of the prothrombin time, disseminated intravascular coagulation, coagulopathy, thrombocytopenia. Reproductive: Prolonged pregnancy and labor, stillbirths, lower birth weight infants, antepartum and postpartum bleeding. Respiratory: Tachypnea, dyspnea. Skin and Appendages Disorders: Rash, alopecia, angioedema, Stevens-Johnson syndrome. Urogenital: Interstitial nephritis, papillary necrosis, proteinuria. Vascular (Extracardiac Dis-orders): Allergic vasculitis. The following is a list of additional adverse events that have been reported either in the literature or are from postmarketing spontaneous reports for either dipyridamole or aspirin. The causal relationship of these adverse events has not been established: anorexia, aplastic anemia, pancytopenia, thrombocytosis. Over the course of the 24-month study (ESPS2), patients treated with AGGRENOX showed a decline (mean change from baseline) in hemoglobin of 0.25 g/dL, hematocrit of 0.75%, and erythrocyte count of 0.13 × 10 6 /mm 3 . Because of the dose ratio of dipyridamole to aspirin, overdosage of AGGRENOX (aspirin/extended-release dipyridamole) is likely to be dominated by signs and symptoms of dipyridamole overdose. In case of real or suspected overdose, seek medical attention or contact a Poison Con-trol Center immediately. Careful medical management is essential. Symptomatic treatment is recommended, possibly including a vasopressor drug. Gastric lavage should be considered. Administration of xanthine derivatives (e.g. aminophylline) may reverse the hemodynamic effects of dipyridamole overdose. Since dipyridamole is highly protein bound, dialysis is not likely to be of benefit. Salicylate toxicity may result from acute ingestion (overdose) or chronic intoxication. The early signs of salicylic overdose (salicylism), including tinnitus (ringing in the ears), occur at plasma concentrations approaching 200 µg/mL. Plasma concentrations of aspirin above 300 µg/mL are clearly toxic. Severe toxic effects are associated with levels above 400 µg/mL. A single lethal dose of aspirin in adults is not known with certainty but death may be expected at 30 g.
Treatment consists primarily of supporting vital functions, increasing salicylate elimination, and correcting the acid-base disturbance. Gastric emptying and/or lavage are recommended as soon as possible after ingestion, even if the patient has vomited spontaneously. After lavage and/or emesis, administration of activated charcoal, as a slurry, is beneficial, if less than 3 hours have passed since ingestion. Charcoal absorption should not be employed prior to emesis and lavage. Severity of aspirin intoxication is determined by measuring the blood salicylate level. Acid-base status should be closely followed with serial blood gas and serum pH measurements. Fluid and electrolyte balance should also be maintained. Hemodialysis and peritoneal dialysis can be performed to reduce the body drug content. In patients with renal insufficiency or in cases of life-threatening intoxication, dialysis is usually required. Exchange transfusion may be indicated in infants and young children. The recommended dose of AGGRENOX (aspirin/extended-release dipyridamole) is one capsule given orally twice daily, one in the morning and one in the evening. The capsules should be swallowed whole without chewing. AGGRENOX capsules may be administered with or without food. AGGRENOX is not interchangeable with the individual components of aspirin and Persantine ® Tablets. AGGRENOX (aspirin/extended-release dipyridamole) is available as a hard gelatin capsule, with a red cap and an ivory-colored body, 24.0 mm in length, containing yellow extended-release pellets incorporating dipyridamole and a round white tablet incorporating immediate-release aspirin. The capsule body is imprinted in red with the Boehringer Ingelheim logo and with "01A". AGGRENOX is supplied in unit-of-use bottles of 60 capsules (NDC 0597-0001-60). Store at 25°C (77°F); excursions permitted to 15-30°C (59-86°F) [see USP Controlled Room Temperature]. Protect from excessive moisture.